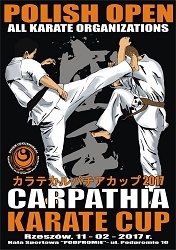 Polish Open Carpathia Cup, gathered 470 athletes from several countries: Lithuania, Belarus, Ukraine, Germany, Austria, Slovakia, the Czech Republic, Hungary, Sweden and Poland in 2016. This time the venue is changed to a bigger stadium, and the 2017 edition will offer eight tatami`s to fight on! Now the date are set for next years tournament, note the date,and keep the dates 11th February 2017. Video from 2016 – see among others European champion Szabó Zsófia..